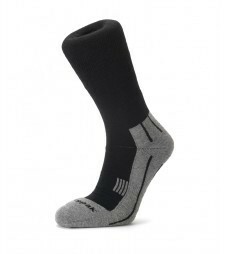 The Snugpak Technical Merino Sock is a lightweight, comfortable sock, ideal for shorter ventures or when a smoother, lower profile sock is required. Ideal for warmer temperatures. The blend of cool Merino and synthetic materials provides all-day use and the low profile, in-turned welt, provides support to both the foot and there is a reinforced Achilles section. Extra padding on the sole is ideal for rock boots and approach shoes. Additional venting channels allow warm air to escape in the summer and traps warmth on colder day.